Also, it is not recommended to spray until 40-50% of buds of a given variety are at the F2 stage and there is no need to spray if you have no history of mummy berry disease on your farm. Mature apothecia cups are now present and actively sporulating so we have inoculum present at this time. 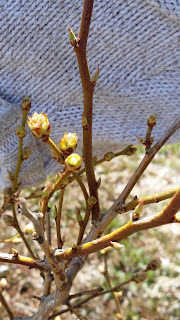 The early variety ‘Bluetta’ had 70% of flower buds at the F2 development stage while the mid-season variety ‘Bluecrop’ was found to have 50% of its flower buds at the F2 stage. The late mid-season variety ‘Nelson’ was at 10% F2 while the late varieties ‘Jersey’ and ‘Burlington’ were at 0% F2. Surprisingly, the early variety ‘Duke’ was only found to be at 10% F2 but it appears most early and mid-season varieties are now at the ideal development stage for infection. A 15.5 hr long wet period from Saturday afternoon April 23rd through to early Sunday morning April 24th would have been sufficient for a high risk infection period but most (if not all) varieties would not have been at a susceptible bud stage and very little (if any) active spores were present at that time in Kings County; however, we can now say that we are now in the primary ‘mummy berry infection season’ and must either use a “fixed sprayed schedule” to protect bushes from infection or a ‘weather based spray program’ to control infections using controls that have “back-action” capability (eg. Topas). 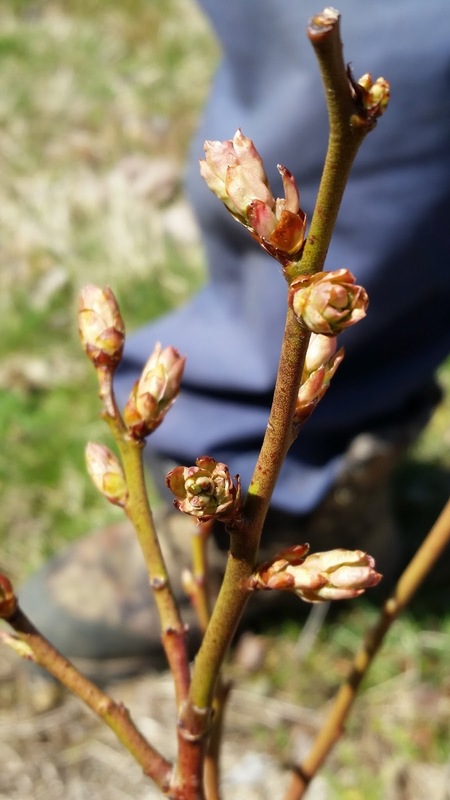 A ‘fixed spray schedule’ may be used to manage the disease whereby the first fungicide spray should be applied when 40-50% of the flower buds have reached the F2 stage (flower bud scales separating). One or more additional sprays may be required on a 7-10 day schedule. As such, most early and mid-season varieties would benefit from their first cover as soon as possible while sprays to later season varieties may be delayed until their bud-development reaches the recommended 40-50% F2 stage. Alternatively, a ‘weather based spray schedule’ may be employed. This strategy uses temperature and leaf wetness duration to determine if an infection period has occurred. If an infection period occurs and mature apothecia are present, and flower buds have reached the 40-50% F2, then the grower has up to 72 hours after the start of the wet period to apply Funginex, Mission, or Topas. An additional spray(s) may be required, depending on weather conditions, 7-10 days later. Identification of infection periods for back-action control will be communicated through this forecast in the coming weeks so please stay tuned and have your sprayers ready.